During the late 19th century, Newark was considered the beer brewing center of the United States. Then home to a large German immigrant population, the city supported at least six major breweries at this time. The brewery owners built large, impressive houses for themselves; the Ballantine Mansion, now restored and part of the Newark Museum, is the most famous of these. A number of the mansions were constructed on or around High Street, now Martin Luther King Boulevard. One remarkable surviving and intact Newark “beer baron” mansion was built for Franz J. Kastner, the wealthy owner of the Phoenix Brewery. The Kastner Mansion is located at 176 Clinton Avenue, around the corner from Martin Luther King Boulevard, and is prominently sited on an oversized mid-block lot. Constructed in 1892, the house is a three-story, 32-room Chateauesque structure, a costly and relatively rare style in New Jersey. The building is predominantly brick construction, with carved brownstone ornamentation. The house remained a private residence until 1957, when it was converted into a casket factory and was expanded with a large two-story addition, which included a workshop and a loading dock, at the rear of the structure. Subsequently, the business sold the building to Newark Lodge 93 of the Benevolent and Protective Order of the Elks for use as a lodge. The mid-century addition was used as a ballroom and event space. In 2007, the Elks sold the building for $1 to Denise Colon, a Newark business owner, and community leader. The building is in generally sound condition and retains remarkable exterior features including a turret. Decorative brownstone pediments, columns, and surrounds remain intact, although the masonry is starting to exhibit evidence of spalling and deterioration. The original slate roof with eyebrow dormers is intact, but in poor condition, recently covered with tarps to prevent further damage from a number of major leaks. The front stoop has suffered from chronic water damage and is also in poor shape. Inside, the first floor is in good condition and exhibits extensive woodwork including an ornate wood stair. The second and third floors have been more significantly altered, by both modernization and intrusion of the elements. The heating system has not been operational since 2007. The owner is currently attempting to restore the building and identify an appropriate new use for it. Uses under consideration include a community center, a meeting space and a job training facility. A local job corps group has expressed interest in moving into the building. Through sweat equity and material and labor donations from local contractors and merchants, the owner has made some progress in stabilizing the building but has not yet been able to raise the funds for the substantial restoration effort required. The rehabilitation of the Kastner Mansion presents yet another ideal opportunity for historic preservation to foster revitalization, job creation, and reinvestment in an area and a city that could truly benefit from these forces. The building is seen as a key anchor on its block of Clinton, and surrounding residents appreciate the building and associate it with their neighborhood’s prosperous legacy. The Brick City Redevelopment Corporation, a Newark redevelopment agency well known in the city for its new construction initiatives, has shown some interest in the restoration of this building, but as of yet, there have been no grants or funding for any improvements. It will take creative thinking and teamwork to move the Kastner Mansion rehabilitation into high gear. The building’s owner wants to preserve the house and has shown ingenuity in obtaining donations and volunteer labor to help make the structure weather tight, but additional and significant support is needed. A firm plan for the building’s future use could help the project secure funding; for instance, the project could benefit from the Federal Historic Preservation Tax Credit if the mansion were planned for an income-producing use. 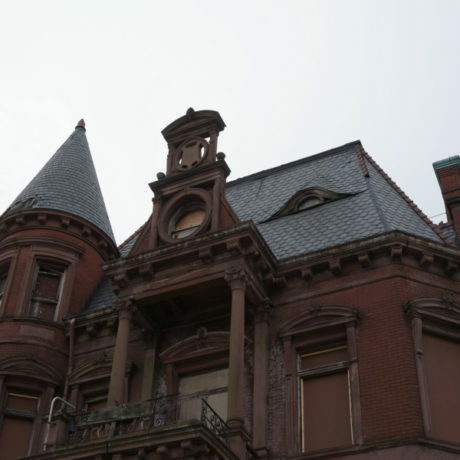 The Kastner Mansion tells an all-too-familiar story of once-prosperous urban areas with a wealth of unique historic resources, and the challenge of prioritizing heritage preservation in environments with so many competing significant needs. But do these needs necessarily have to compete? Large-scale rehabilitation projects such as that of the Kastner Mansion create jobs and engender revitalization. The solutions these projects create make them worth prioritizing. Support for the Kastner Mansion rehabilitation and similar projects would be a sound investment in the feasibility of adaptive reuse of historic buildings, in the transformation of residences into viable community-based uses, and in the value of supporting historic preservation on the local level. The time for this investment is now.